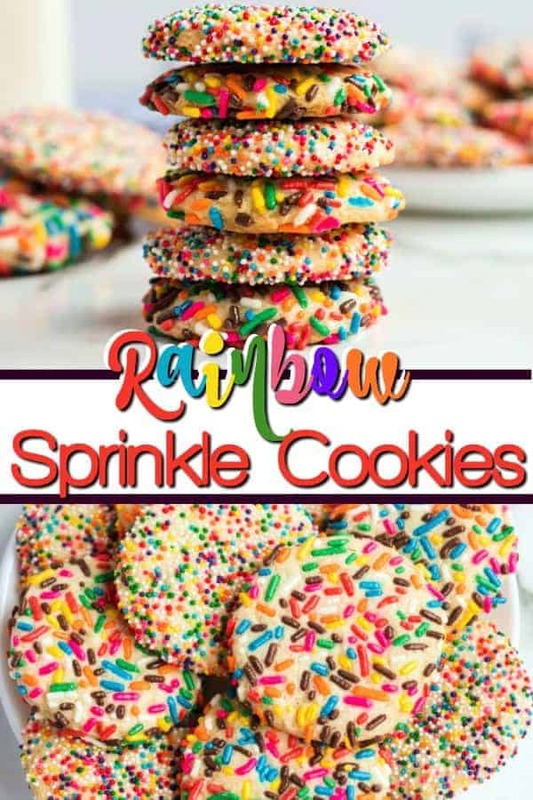 Rainbow Sprinkle Cookies - Soft, delcious and covered in sprinkles! Rainbow Sprinkle Cookies are the happiest cookies on the planet! These soft and delicious cookies are covered in sprinkles. They are the perfect special treat for a birthday, Valentine’s Day or the best for a Christmas Cookie Swap! Our version is better than any bakery cookie! We love cookies and some just make us extra happy! Just like our Sugar Cookies with Sprinkles, our Sugar Cookie Bars and our Sugar Cookie Spoons make everyone smile! Are you a cookie fan? Have you ever heard of the Secret Copycat Neiman Marcus Chocolate Chip Cookie story? You must check it out and try to make these better than you have ever tasted chocolate chip cookies! We have some of THE BEST COOKIE RECIPES ever! Be sure to take a few minutes and check them all out! Do you have a food that totally brings you back to your childhood? Something that as soon as you see or smell, it immediately reminds you of a location or a person or a time in your life. Well, these cookies do just that for me. Another one that I just love is this Instant Pot Monkey Bread Recipe. If you are looking for something easy, this easy dessert recipe is for you! Sugar Cookies with Sprinkles … that’s an understatement! They bring me back to years ago, when I was a little girl and I would go visit my grandpa at his work, he owned a dry cleaner. These were the days where you didn’t just drop off your laundry and leave. The owner knew everyone who came in and they knew him. They would chit chat while picking up their cleaning. I loved to visit there and I knew that at the end of my visit, we would go a few stores down to the Jewish bakery and my grandpa would let me pick something out. Every single time, I would get the exact same thing – a big, giant rainbow sprinkle cookie. Not just your average sugar cookie with sprinkles, this cookie was special. The sprinkles were baked into the cookie, no icing to take away from the delicious vanilla with a hint of almond flavor. Just the cookies and the sprinkles! Every time and they were always delicious! 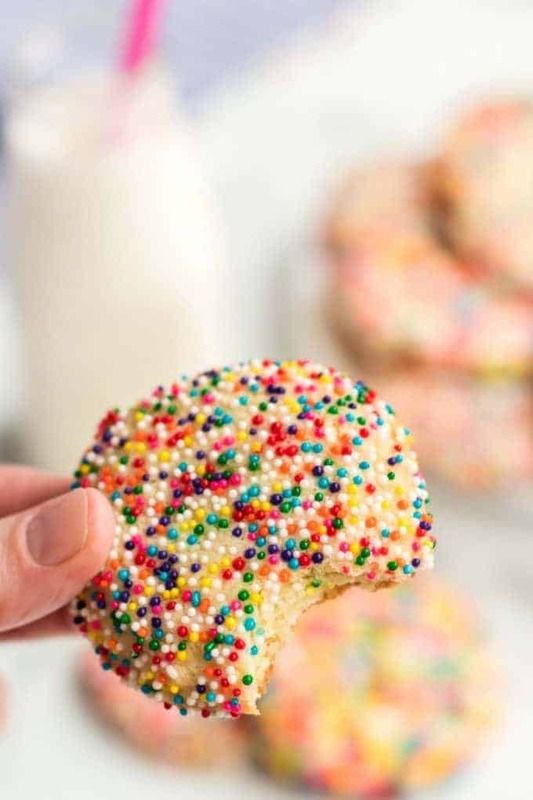 So when I tried these King Arthur sugar cookies from King Arthur’s Flour, they immediately reminded me of the taste of my giant rainbow sprinkle cookies! They brought me right back to that bakery by my grandpa’s dry cleaner! I thought with a little adaptation, I could re-create my favorite childhood cookie. So, as usual, I called my sister, Julie, to help me make it happen! We spent the day tinkering with the recipe, which was almost perfect, to make our sprinkle cookies! I have to say, not only were they spot on with the flavor, they were actually even better than the cookies we had from the bakery. The bakery cookies were crunchier and a little drier than these cookies. These cookies were soft, moist and totally addicting. Note: I beg of you, do not lazy out and go get those slick and bake cookies and cover them in sprinkles! 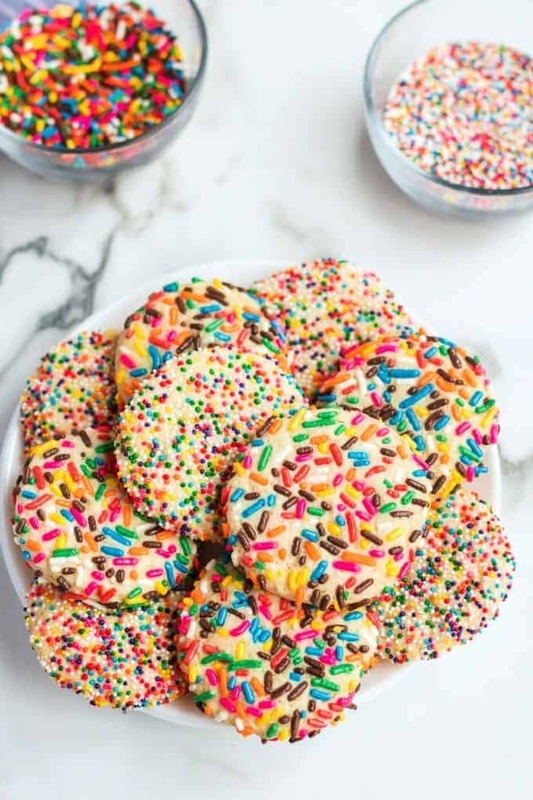 I am all about baking hacks, but do not deny yourself the pleasure of these soft and fresh baked sprinkle cookies! They are a zillion times better than a slice and bake sugar cookie any day of the week! Then it was time to add my favorite part, the sprinkles!!!! 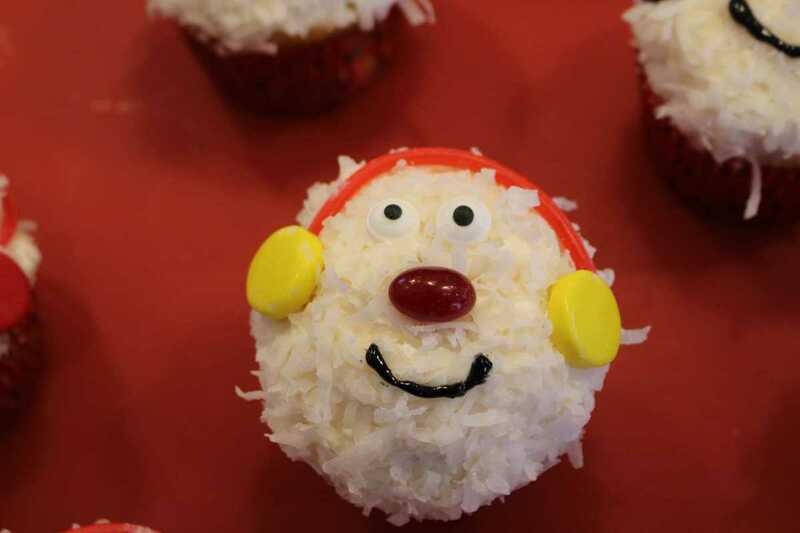 Now you don’t want to just put the sprinkles on with frosting…that just wouldn’t cut it. You don’t want the frosting to get in the way of the sprinkle to cookie ratio. That is why you have to make the sprinkles on top of the cookie! 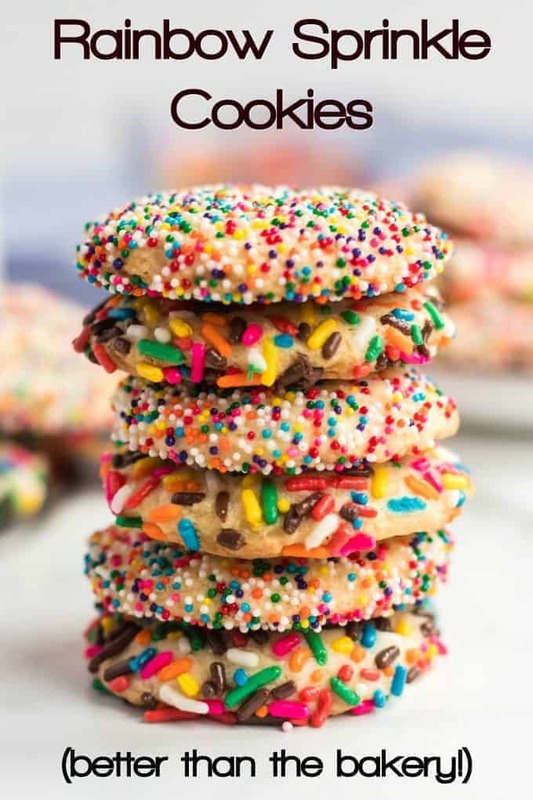 The key is rolling the raw cookie dough into tiny balls (or larger if you want a bigger cookie) Then you roll the dough balls in the colorful sprinkles or nonpareil sprinkles, but not on the bottom of the cookie, just the top and the sides. Be sure to cover them really, really good! I am always asked “do you put the sprinkles on the cookies before baking?” Yes, you do it before you bake them! They bake right into the cookie perfectly. Don’t worry, the sprinkles will not burn! Trust me on this one…I am a sprinkle expert! 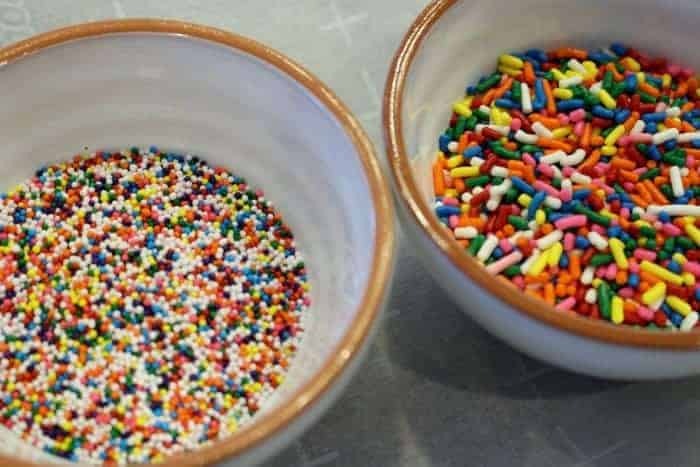 Sprinkles vs. nonpareils, that is the question! Which do you like better? The crunchy nonpareil or the softer rainbow sprinkle or jimmies. Personally, I prefer the colorful nonpareil, but Julie, she is a jimmie girl. Either way, these cookies are so incredibly cute. I swear I could stop screaming about how adorable they are! These cookies are just so happy – they actually could be called “Happy Cookies” because just looking at them makes me smile. Just wait until you taste them…they will really make you smile then!! My son, Joey, is a protege in the making! As soon as he saw these, he grabbed two cookies off of the plate and a tub of ice cream and made this delicious Rainbow Sugar Cookie Ice Cream sandwich!! Seriously…what could possibly be better than this? 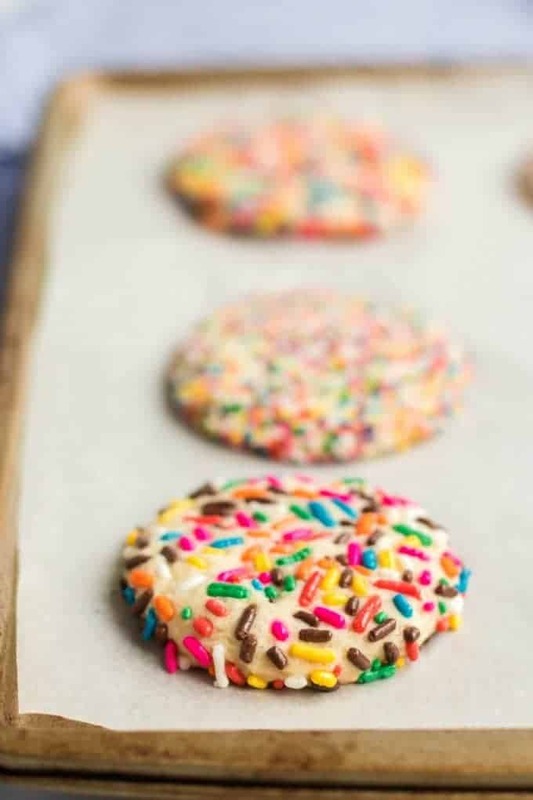 Want to make them Gluten Free Sprinkle Cookies? Follow the recipe as is, just substitute the flour for Gluten Free Flour. My friend, Lisa, who tested them out recommends Gluten Free Flour by Jules. She says it is THE ONLY gluten-free flour she will use! Lisa also put the dough in the refrigerator and chilled for about 10 minutes before rolling in the sprinkle! She said they were one of the best Gluten Free Cookies she has ever tasted! Rainbow Sprinkle Cookies are the happiest cookies on the planet! 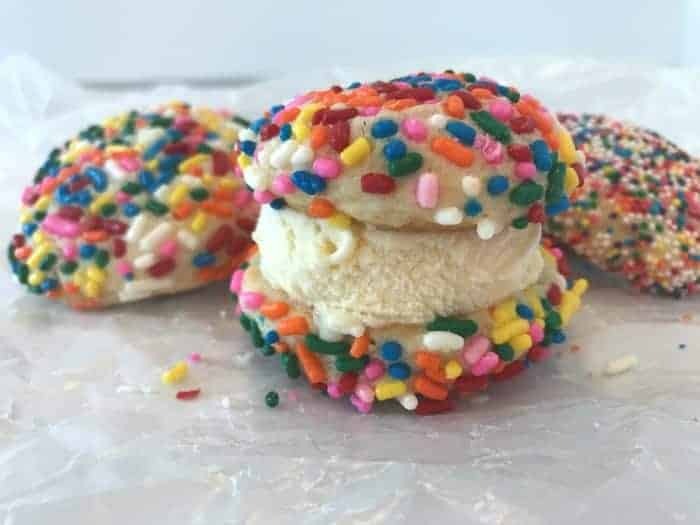 These soft and delicious cookies are covered in sprinkles. They are the perfect special treat for a birthday, Valentine's Day or the best for a Christmas Cookie swap! In a large bowl, cream together the butter and sugar. Add in cream cheese, egg, vanilla extract, almond extract. Mix together until combined. In a medium bowl, whisk together the flour, salt, baking powder, and baking soda. Mix into the large bowl on slow to medium speed, adding in a little at a time, until evenly moistened. 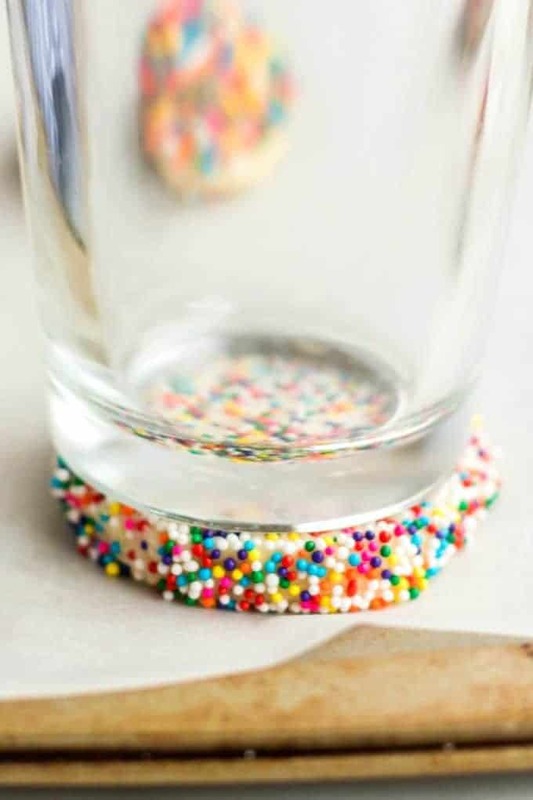 Use the bottom of a glass and gently press down on the cookie to slightly flatten it. You want them between 1/4 inch and 1/2 inch thick. Bake in the oven for approximately 10-12 minutes (every oven cooks differently so watch them, mine took closer to 12 minutes, but you don't really want them to brown). Let cool on pan for a few minutes and then transfer to a wire rack to cool. 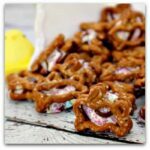 Want to make these Rainbow Sprinkle Cookies Gluten Free? Follow the recipe as is, just substitute the flour for Gluten Free Flower. My friend, Lisa, who tested them out recommends Gluten Free Flour by Jules. She says it is THE ONLY gluten-free flour she will use! Lisa also put the dough in the refrigerator and chilled for about 10 minutes before rolling in the sprinkle! We’re cooking with flower now, not flour? Maybe edit your blog before posting! What do I do with the egg? OOOOPS! So sorry! You add it in when you add the cream cheese and vanilla. Just fixed the recipe card! Thanks for the catch! what do I do w/the egg hehe thats funny. Dunno maybe put it in the mix haha. I think Janet is not making cookies. Omigosh these were my favorite cookies too as a young girl! I’m from the same part of Michigan as you and I can remember these cookies from the Italian bakeries. I was wondering if they would freeze well. Thank you for the recipe. These cookies are very good. I ran out of sprinkles so I rolled the cookie in coconut. It was amazing. Thank you for the recipe. 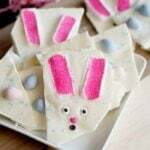 I am planning to make it and surprise my kids only thing any alternative instead of cream cheese. This recipe is the closest I’ve ever gotten to the “big rainbow cookies” I’d get from my local bakery as a kid. They’re delicious! But I have one question: how long do the cookies last in either an airtight container or in a sandwich baggy? These were some of the best cookies I have ever made. The texture is perfect, not too crunchy, not too cakey. 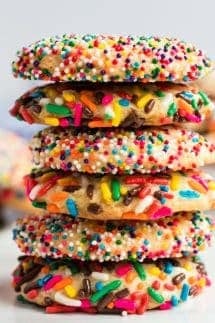 They look beautiful with the sprinkles, and the touch of almond lends a wonderful flavor to an otherwise simple cookie. I will be making these regularly from now on! They were a huge hit with my husband and at work. Thank you SO much for your comment – I couldn’t have described these cookies any better! Brings back such fond memories! Thank you for taking the time to comment and warm my heart!